NXT-Spy – First successful implementation of the ball finding / catching. Today is a big day for this project, the robot now manages to find balls and to catch them on its own. In fact, all last week problems are solved: A ball of Blu-Tack solved the balancing problem and the solution I thought about last week to solve the lag problem worked quite well, in fact, apart the fact that the robot is moving very slowly, it manages to find balls quite efficiently. Well done; how about finding the Blue and Red corners? They work most of the time but because the flag goes out of view it makes it hard to know when you have reached the corner. Has also written up the report so far as he is not here next week. So he has done two week’s work in one!!!! Today, I realised something: for the moment, the Controller is analysing the coordinates of provided by the different coordinates buffer processes, so the controller can be analysing several times the same image as long as no new images have been processed. But because we have a big lag with the receiving of the images, it might not be the appropriate solution because it is not precise enough. So the solution might be better if all the coordinates buffer become blocking as long as no new coordinates have arrived. By doing that, the controller would do an action to control the robot only when an image processor outputs a new coordinate. I will try this out next Wednesday when I will have access to the robot’s environment again. So this has been a big week! As usual in things that involve robots you go two steps forward and one back. The fact that the android/lejosNXT problem have been solved for Bluetooth was very fortunate! To work first time was just amazing. Send a note of thanks to the the person that posted it!! I am not surprised that the image processing is causing a problem due to frame rate that is possible with his version of the phone. So therefore the robot behaviour has to take account of this limitation. That is wiggle slowly to find target by processing each image until a target is found. ; then moving more quickly towards target. The robot will have to move more slowly – so what!! Today, I have been able to test for the first time the robot’s controller in an ideal environment. This experiment cannot really be called as a success as I have faced a very disturbing issue: even when we are working in the best conditions (for this experiment, I worked with a Wi-Fi ad-hoc connection between the phone and the PC instead of using a router between the two), the images rate is still too low to be able to easily control the robot. 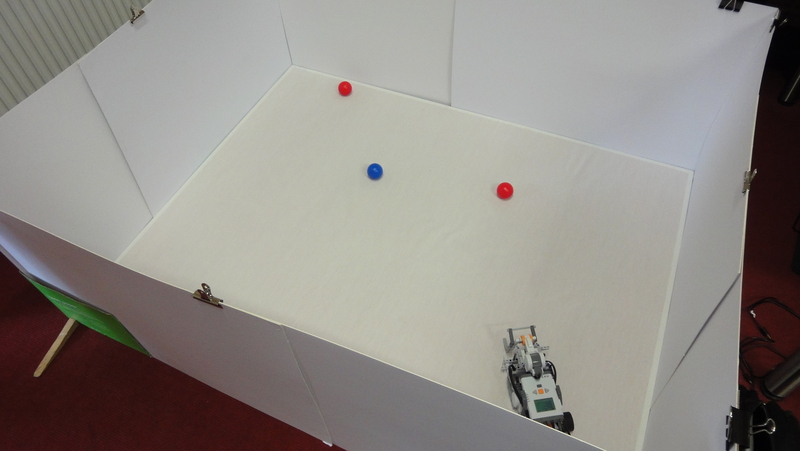 To solve this problem with the current configuration, I think that the best way is either to try to predict the position of the ball based on the speed of the robot or to simply slow down the speed of the robot to a minimum. A second minor problem is that as predicted, the robot is too heavy on the phone’s side, the solution is obviously to put a weight on the other side of it to counterbalance. But there are not only bad news: automatic control of the robotic arm works like a charm: as soon as the ball is touching the arm, it lifts it.